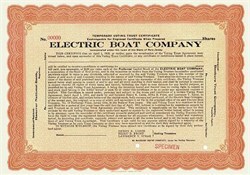 Beautifully engraved SCARCE Specimen Certificate from the Electric Boat Company . This historic document was printed by the American Banknote Company in 1915 and has an ornate border around it. This item has the printed names of the company's voting trustees and is over 103 years old. This is the first time we have had this for sale and we only have one. The Electric Boat Company is a subsidiary of General Dynamics. It currently designs and builds nuclear submarines for the US Navy. At the height of the Cold War Electric Boat had as many as 25,000 workers building as many as 15 nuclear-powered submarines at a time. Currently about 7,500 workers are employed at Electric Boat, where there are more engineers and designers than laborers. With more than a century of experience, the Electric Boat company has established standards of excellence in the design, construction and lifecycle support of submarines for the U.S. Navy. Primary operations are the shipyard in Groton, Conn., and the automated hull-fabrication and outfitting facility in Quonset Point, R.I., with a current workforce of nearly 9,000 employees. In 1911, the Electric Boat company acquired the New London Ship and Engine Co. in Groton, Conn., to build diesel engines and other machinery and parts for submarines and commercial ships. During World War I the Electric Boat company received orders to build 85 submarines for the U.S. Navy. The company's ELCO subsidiary builds 722 submarine chasers, while another subsidiary, the Submarine Boat Co., builds 118 Liberty ships. In 1934, the USS Cuttlefish was the first submarine ordered by the U.S. Navy since 1918, is delivered. Cuttlefish is also the first welded submarine and the first submarine built in Groton for the Navy. Over the course of World War II, Electric Boat produces 74 submarines and 398 PT boats. These submarines accounted for 39 percent of all Japanese ships sunk (1,178 merchant vessels and 214 warships). In the early 1950s, the company designed and built the first nuclear-powered submarine, the USS Nautilus.